Veteran journalist and author Joseph C. Goulden offers a good review of Stephen Harding's The Castaway's War: One Man's Batlle Against Imperial Japan for the Washington Times. Of all the combat veterans I have encountered in almost half a century of writing, not a single person has claimed the accolade “hero,” regardless of the number of ribbons he wears. I recall vividly the reaction of a much-decorated veteran of the Korean War when I suggested his actions earned him such a designation. He uttered a terse curse word, then grinned. “Let the historians sort out that kind of stuff,” he growled. One person who surely deserved the honor is a Navy lieutenant named Hugh Barr Miller Jr., who was 34 years old in 1943 when a Japanese torpedo sank his destroyer, the USS Strong, off the Solomon Islands in the Pacific. His remarkable story is told by Stephen Harding, a Virginian who edits Military History magazine. ... As he slowly recovered — but by no means back to normal — Miller made a decision. He regularly saw barges laden with Japanese soldiers in the strait separating the islands. 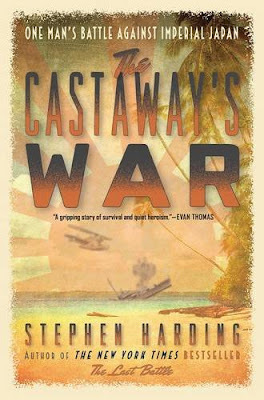 He decided that “as long as he remained on the island, it was his duty to do whatever he could to gather useful information on the Japanese forces operating in the vicinity. Any details he could amass — the designations and strengths of units, the locations of heavy weapons and strong points, the timing of patrols — would be of immense operational value” to planners of the eventual invasion of Arundel. Miller reasoned it would be easier to interdict the barges than it would be to fight the Japanese ashore. He fashioned a “look out position” a few yards from paths taken by Japanese controls and took notes.